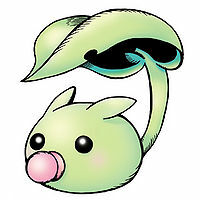 A Slime Digimon which has a breath of fresh greens (a tiny leaf) on its tail. It has many of the elements of a plant and the composition of its body includes chlorophyll, so it photosynthesizes to grow. 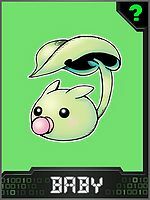 It possesses a leaf-shaped tail, and the leaf protects it from intense sunlight or when it is raining. Due to its pure nature, it doesn't distrust others even if they are frightening. However, it is just a little bit shy. As it was just born it is unable to battle, but its innocent spirit, overflowing with vitality, can make the surrounding people remember pure feelings that were forgotten, wrapping them in a calm air. However, if one tries to mess with it too much, it will spit acidic bubbles to intimidate them. Anime/Manga Digimon Adventure 02: "When a Digivice is Infected by Darkness"
Sansei no Awa  Acidic Bubbles 酸性の泡 N/A Spits acidic bubbles from its mouth. Leafmon is the partner of Ichijouji Ken. 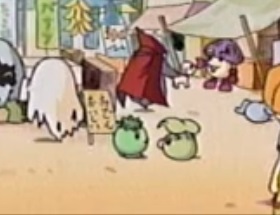 First appeared when Wormmon was reborn at Village of Beginnings. He also appeared when Paildramon or Imperialdramon lose so much power that Wormmon and V-mon are no longer able to maintain their Child forms. A Leafmon is seen at Akiba Market. Other Leafmon were seen at both Villages of Beginnings. Leafmon appears when Wormmon is defeated and devolves. 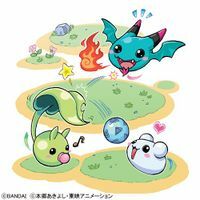 A non-playable Digimon.